Get readers excited to learn about the various technological innovations that have occurred throughout history--and what could be possible in the future! Through informational text, interesting and intriguing facts in conjunction with vivid images, diagrams, and charts, readers will learn about miraculous inventions such as holograms, 3D printing, virtual reality technology, personalized medicine, and bionic body parts. 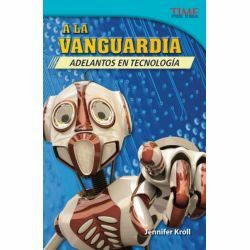 Throughout this Spanish-translated nonfiction title, readers will be engaged and encouraged to imagine the next big technological innovation that could change the world!